Gallup estimated that 68% of the UK workforce are disengaged. Hay Group put the economic cost of this at £340bn a year. Figures like this can feel abstract. Sure it sounds significant, but most of us can’t relate to the context of billions. Besides, that percentage could be lower in your business. It could also be higher. Let’s err on the side of caution for a moment and unpack the term ‘disengagement’ – starting with how it’s calculated. Employee engagement, like brand sentiment, is something that might seem intangible and difficult to measure. However, while it‘ll never be as black and white as profit and loss, our understanding of what engages employees and the positive impact it has on bottom line growth is now pretty solid. Those metrics are lagging indicators – they’re numbers that already exist and can be used to establish disengagement trends. The other numbers you need to be tracking are leading indicators – ones that predict future events. This doesn't require a Head of Clairvoyance. These indicators exist in your company culture. Working with them challenges HR leaders to take a closer look at the mechanics of teams, to track metrics on their people’s commitments, moods and ambitions. It takes studying indicators such as the duration of time an employee has been with the company and the relationships they have with their colleagues and managers. Accurately measuring the ROI of employee engagement takes a blend of metrics, improving it takes a hands-on approach to cultivating the right company culture. Before either is possible, you’ll need to crunch the numbers and get the buy-in of your senior leadership team. 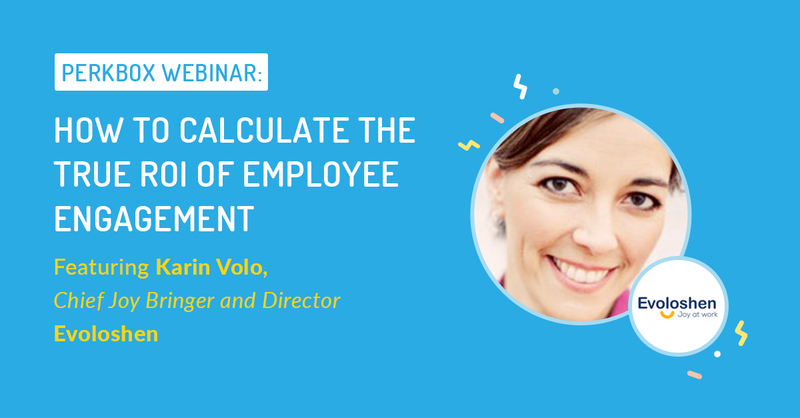 Together with Karin Volo, Chief Joy Bringer and Director at Evoloshen, we’ve cracked how any organisation can calculate the ROI of employee engagement. We’ve compared notes on how best to convince the most frugal of CFOs and SLTs to grant budget for engagement initiatives. With that financial backing secured we’ve identified the five cultural keys to boosting engagement and morale. And we’ve arranged a webinar to show you how it’s done. How much disengagement is costing your business. How to justify your investment decisions to the senior leadership team (SLT). The 'five cultural keys' to boosting your staff's engagement and morale.